CLAW will be bundling all of the emails on which we were copied (including those from our online form) and passing them on to the WPW committee. Comments can still be submitted up until the April 24th hearing. Please send your personal message to all of the members and staff of the Water, Parks, and Wildlife (WPW) Comittee, asking them to vote YES in support of AB 2422. 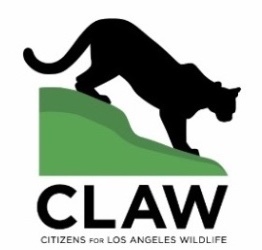 Citizens for Los Angeles Wildlife (CLAW) is a public benefit non-profit 501(c)(3) environmental organization that works to protect and restore the environments of wildlife of Los Angeles and California from dwindling open spaces. Our mission is to promote, educate and protect the fundamental importance of wildlife, wildlife habitats and wildlife corridors everywhere.